Which one of these movies is your favorite? You can find this out by doing a little oldie-of-the-day math test. Good luck! mmmm i got #5 but perhaps that i'm still a big fan of #9.
you should learn about Sarcasm its very funny sometimes but people get messy sometimes with it. 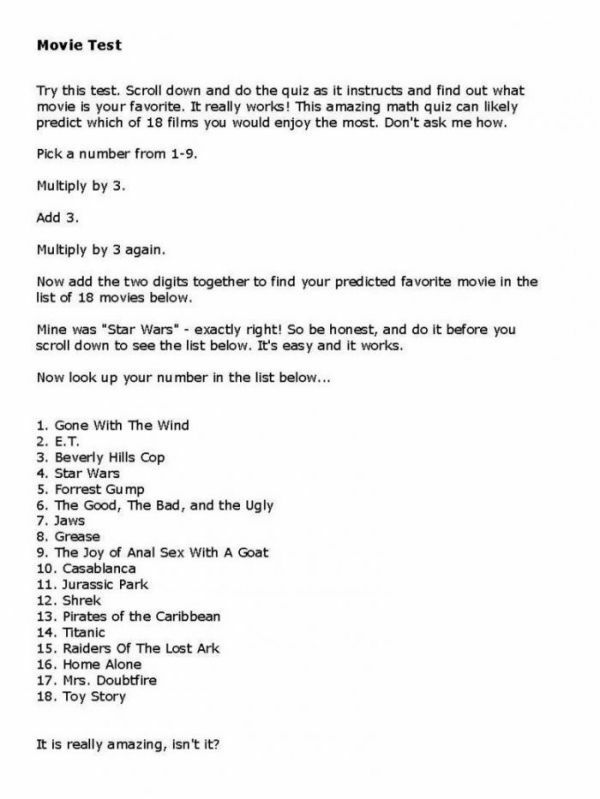 i got 9 :D It's an epic movie damn who's the genius who math this test? pick x and you get 9 * x + 9 which is divisible by 9. As a rule, any number divisible by 9 has the sum of its digits divisible by 9, and in this case, because x is in the [1, 9] interval you always get 9. I picked "1" and the result is... #18. And i really dont like Toy Story. I prefer #9.
i want 9 .. i want 9.. i want 9.. I'm glad you all enjoyed my performance in #9. In 20012, I'm planning on releasing a sequel once I'm finished with this silly lawsuit brought against me by the ASPCA. and here i thought i was the only one.. I got 9 as well. Never heard of the movie. I expect someone has made it up. Lame.